Such a beautiful set got it for my 4 year olds bedroom she loved it the unicorn and pink ruffle accent pillows how soft the fabric is and all the colors are nicely matched. Its just perfect totally recommend it. Nestle in clouds with the Urban Habitat Kids Bliss Coverlet Set. The coverlet showcases various cute and fluffy clouds in a colorful a palette of pink, aqua, and white. Within each cloud is a playful design that adds extra charm and dimension to the bedspread. The coverlet reverses to a solid, soft pink. 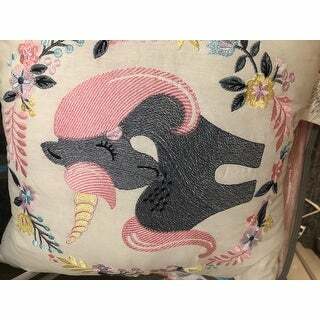 One pillow features all over ruching and the other features an embroidered unicorn. Made from 100% pre-washed, pre-shrunk cotton, this coverlet set is hypoallergenic and bed-ready right out of the package. My 5 year old loves this! 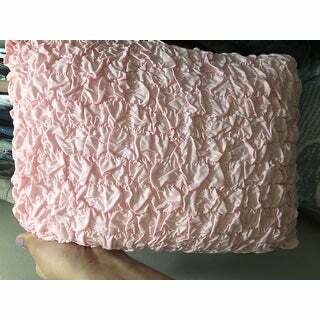 Came with two decorative pillows both stylish and comfortable a unicorn and pink one. The only downfall is it did not come with a sheet set. But there are so manny colors in it that any Color set will work. This is an absolutely adorable set. I bought it for my 3 year old daughters room. Initially I thought the pattern may be too busy, but it wasn't! It's perfect. The comforter is actually two-sided. The back side is solid pink so you'll have options. Also, there are a variety of colors in the set like pink, white, teal, gray so it's versatile and will probably match with a variety of colors in a bedroom. I bought cream sheet sets (sheets are not included) and they work just fine with all the colors. 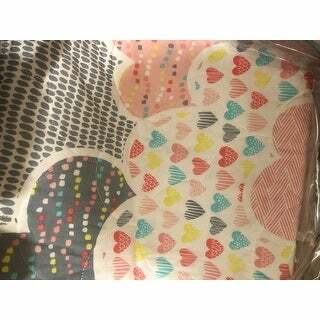 Adorable bedding! It's soft and my daughter loves it. The decorative pillows are a really nice touch on the bed and it is wonderful how a purchase like this can jazz up a whole room. So pretty and soft for little girls. It was Perfect for my daughters unicorn themed bedroom! She really loved it and I was very excited with just how cute it was! Exactly what I was expecting. Great color. Nice and bright. Super cute. My daughter loves it. Purchased for my great niece bedroom. She loves it. Done her room around this comforter. Such a versatile piece to work with.